(NaturalNews) A Natural News investigation has confirmed that Amazon.com (AMZN) is functioning as a retail "front" for a rapidly-expanding list of dietary supplement counterfeiters who profit by exploiting the Amazon.com trust factor to sell fake products to unsuspecting Amazon customers. 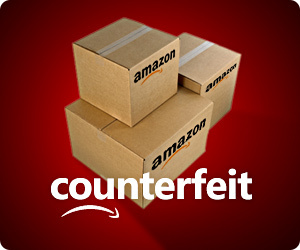 This counterfeit operation does not appear to be the intention of Amazon.com itself, which is a widely-celebrated online retailer, but rather a result of Amazon's inability to adequately police the tens of thousands of third-party sellers who sell products through the site. • Counterfeit dietary supplement companies are very easily able to repeatedly and successfully sell a multitude of counterfeit nutritional products through Amazon.com. • Amazon.com is unable to adequately police these sellers. • Amazon.com is currently unable to distinguish between legitimate (original) manufacturers of a product vs. a counterfeit manufacturer of a fake product. • Amazon.com actually lends counterfeit products a high "trust factor" by assigning high star ratings to products which are wholly counterfeit (see explanation below). • Amazon.com has allowed counterfeit companies to "hijack" its anti-counterfeiting policy, resulting in counterfeiters getting original manufacturers banned from Amazon as if they were counterfeiters. To be clear, Amazon.com is an impressive company in many ways, and Amazon.com remains my favorite online retailer. Amazon excels at inventory logistics, a positive online shopping experience and an impressive IT backbone that keeps the company humming along. I shop at Amazon more than any other single store, and this website maintains thousands of links to Amazon.com books and other products. But I no longer buy nutritional products sold on Amazon.com by third-party resellers. If I'm shopping for a supplement on Amazon.com and it's being offered by a name I don't recognize -- like "MyDiscountShopper" or whatever -- I simply don't trust it. The risk of buying a counterfeit product through Amazon.com right now is simply too high. Among the cases we have confirmed, here at Natural News we have personally experienced our own products being counterfeited and sold on Amazon.com. Several months ago, a company we had never sold product to was suddenly offering our Turmeric product as well as our "Clean Chlorella" product on Amazon. We conducted an in-house investigation and were able to conclusively determine that we had never sold these products to this company, and they had not sourced them from our resellers, either. We filed a counterfeit complaint with Amazon.com, using their counterfeit filing email address. They responded in the affirmative and banned that particular reseller. Not everyone has this same success with Amazon.com counterfeit products, however. On this page, Amazon.com states, "The sale of counterfeit products, including any products that have been illegally replicated, reproduced, or manufactured, is strictly prohibited... If you sell counterfeit goods, we may immediately suspend or terminate your selling privileges and destroy inventory in our fulfillment centers without reimbursement." This is the kind of anti-counterfeiting policy you would expect from the e-commerce leader in America. Unfortunately, though, this very policy is being used by counterfeiters as a weapon to get legitimate, original manufacturers banned from Amazon.com. Natural News has received testimony from a highly-respected nutritional product manufacturer who has been the victim of Amazon.com's anti-counterfeiting policy. We have confirmed the identity and authenticity of this source. They tell Natural News, "...an unknown seller reported us to Amazon for selling [our own] counterfeit products... and Amazon banned us." "This began a conversation with Amazon in which we provided almost every conceivable piece of documentation to prove our identity as the true manufacturer of the products. It should have been a very open and shut case, but it wasn't -- Amazon upheld the ban." "Our customer service team started to receive complaints that our products had decreased in quality and had inconsistent packaging and labeling. This was very puzzling because we hadn't made any production changes. But, we discovered that the customers making complaints had purchased the products off Amazon. After we made a test purchase from Amazon, we realized that our products and other nutritional products being sold through Amazon.com were being counterfeited and sold by unauthorized sellers." Counterfeiters are able to exploit the Amazon.com e-commerce infrastructure by shifting from one seller name to another in chameleon-like fashion. If they get shut down under one account name, they have several others to fall back on, and they're constantly adding new "throwaway" accounts to make sure they always have visibility on Amazon.com. The fact that counterfeiters use fake ingredients to manufacture counterfeit products also means they have a much higher profit margin than the original manufacturers. This allows counterfeiters to often attain low-price leadership positions on Amazon.com, where resellers are recommended based on price sorting (low to high). Customers actually think they're getting a bargain, even when they're buying counterfeit nutritional products that Amazon.com has actually placed in the No. 1 position on these comparative lists. The Amazon.com star rating system can also grossly mislead consumers into thinking a counterfeit product has received a high user rating. This happens because Amazon assigns a star rating to ALL the products that it believes are identical, regardless of which seller is offering them. Thus, if Amazon.com can be tricked by a counterfeit seller into categorizing a counterfeit product as being identical to the original, genuine product, the counterfeit product will enjoy the high-star rating that users have actually assigned to the original product. In this way, the counterfeit product in essence "hijacks" the high star rating advertised by Amazon.com. One original product manufacturer told Natural News, "Amazon is allowing and supporting these acts of deception." Amazon does, after all, earn money on each and every sale regardless of whether the product is genuine or counterfeit. The fact that most nutritional supplements do not generate near-instant noticeable effects (like pharmaceuticals do) further plays into the ability of counterfeit manufacturers to exploit the Amazon.com e-commerce infrastructure for dishonest gains that can go unnoticed by customers for months or years. Until Amazon.com finds a way to effectively police this problem of counterfeit products, I am advising all Natural News readers to avoid purchasing nutritional products through Amazon.com sellers. The risk of obtaining a counterfeit product -- which may actually be dangerous to your health -- is simply too high. Instead, purchase nutritional products directly from companies and names you trust. Natural News hopes that Amazon.com takes this issue seriously and initiates the necessary steps to radically tighten up the use of its e-commerce platform by third-party sellers. Until Amazon can say it is more aggressively and comprehensively policing the authenticity of the products it displays and describes as authentic, it will experience a rapid erosion of customer trust. On a personal note, my hope is to see Amazon take the steps necessary to resolve this issue once and for all. Amazon.com is a wonderful place to shop, and I like the company. It is staffed by some very smart people who seem deeply committed to providing customers a superior shopping and product fulfillment experience. The fact that counterfeit products are slipping through the cracks at Amazon.com is potentially an enormous threat to the company's credibility, legal exposure, regulatory compliance and stock price. If a customer is harmed by a counterfeit product purchased on Amazon.com, Amazon may find itself legally liable for at least part of the damages due to "misrepresentation" and even "fraud" that it has negligently allowed to be carried out on its own website. Planned Parenthood is the Amazon.com of fetal body parts: Online "shopping" for intact baby organs has never been easier!